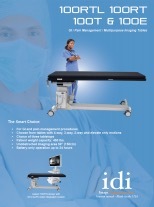 C-Arm table for GI and pain management procedures where tilt, roll and longitudinal tabletop movement is desired. Rail is 6″ long x 3/8” thick x 1-1/8” high. Rotating, with socket for attachment of accessories with 5/8 inch circular post. 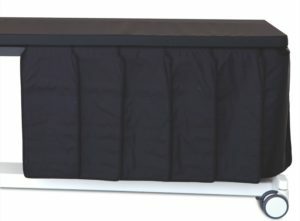 For 28” (71cm)wide Optional Tabletop X100-1325 28”x80” (71x203cm) Dimensions: 59” long. 24” draping below tabletop. Draping extends along both sides and head-‐end of table. Supported by fabric section over tabletop. Not for use with arm board A310-056. For for 24” rectangular tabletop X100-995. Dimensions: 59” long. 24” draping below tabletop. Draping extends along both side and head-end of table. Supported by fabric section over tabletop Note: Not for use with arm board A310-056. 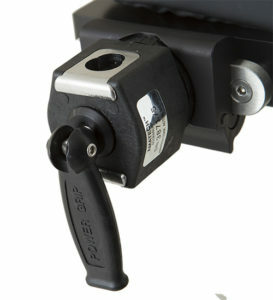 Quick-release, rail mounted. Requires Clamp-on Accessory Rail A100-1007. 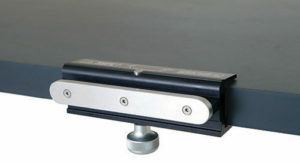 Fixed shield with integrated clamp system. For use with tables that do not have side rails. Clamps to table sides or at head-end of table. Snap-on upper section above level of tabletop is removable. Use with 100RTL, 100RT, 100T, 100E tables. 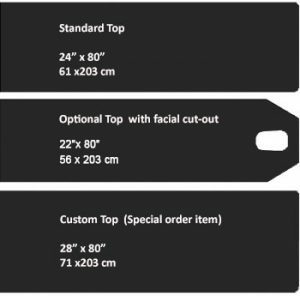 For 22” tabletop X100-733 models with 22” tapered-end tabletop with facial cutout. Dimensions: 59” long. 24” draping below tabletop. Draping extends along both side and head-end of table. Supported by fabric section over tabletop. Note: Not for use with arm board A310-056. 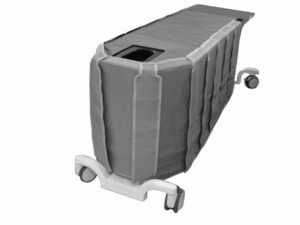 22” x 66” (59cm x 167cm) Heavy-duty, one-piece construction for high-traffic areas. Safe & non-toxic, contains no plasticizers and will not leach over time. Durable brushed texture. Surface is puncture & abrasion-resistant. Antimicrobial properties for added protection. Stain & chemical resistant. No-curl, beveled edges that reduce tripping potential. Non-slip bottom certified by the National Floor Safety Institute. 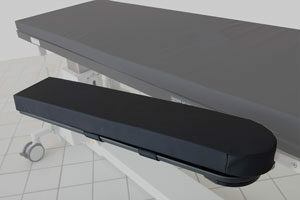 Carbon fiber, shoulder mount (attaches by sliding thin section under patient/table pad), flat. Includes pad and strap. 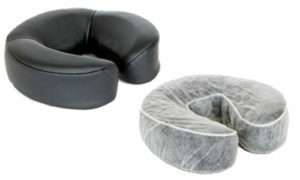 Facial Cushion, crescent shape. Disposable covers for facial cushion, box of 50. 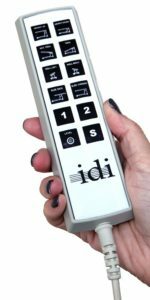 Verify table serial # with IDI for compatibility). Motions controlled: Elevation, trendelenburg, roll, slide. (Included with table). Foot Control unit controls all table motions.